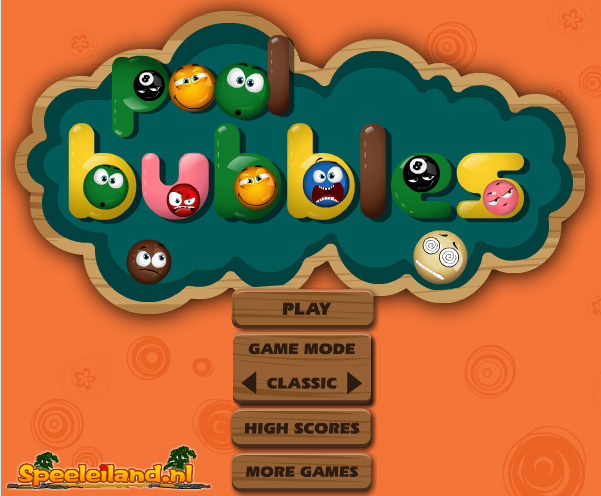 Welcome to Pool Bubbles, an online bubble billiards game! The principle is the following: put bubbles of 3 or more identical colors together to remove them from the grid. Bubbles that are not placed next to other identical bubbles, will fall. The more bubbles you remove, the more the ‘bubble meter’ at the right of the screen gets filled. You finish the level when the whole bubble meter’s full. The game’s over when the bubbles reach the bottom of the grid. The further you get, the harder the levels become: there will be more different colors, but fortunately there will also be bonus bubbles. Remove these bubbles from the field in order to activate the bonus they contain. Bonuses in bubbles that fall will not be activated! In the endless mode there are no levels and the difficulty of the game increases gradually. The game’s over when the bubbles reach the bottom of the grid. Try to keep playing as long as possible!